When Larry Henderson joined London’s Metropolitan Police in 1971 as a Scenes of Crime Officer (SOCO), he thought it would make ‘an interesting career’. He wasn’t disappointed. For more than two decades, Larry worked with just about every police department, in every field, from terrorism to armed robbery, and from blackmail to murder, eventually becoming the head of the Flying Squad’s forensic team, and the UK’s most experienced SOCO. Among countless other events, Larry was called upon to work on the Marchioness disaster, the Broadwater Farm riots, Operation Emerge (the seizure of a tonne of cocaine), the Security Express robbery (£6million in cash stolen) and the infamous murder of baby Louise Brown. Larry joined the Flying Squad during what was arguably the busiest, most exciting and dangerous period of its existence. He dealt with some of the UK’s most terrifying villains and witnessed deadly shoot-outs first-hand. Larry also worked on cases featuring Christine Keeler, Cecil Parkinson, Enoch Powell and Lords Lucan and Devonshire, among countless other politicians and dignitaries, and has dealt with terrorists, murderers, safe blowers, rapists, blackmailers, serial flashers and sadomasochists. Throughout his career, Larry risked his neck (he has been attacked by dogs (twice), a python (once) and fallen seriously ill from a crime scene related infection) and worked tirelessly to improve the science and methods of crime scene examination. His groundbreaking work is exhibited in Scotland Yard’s Crime Museum. 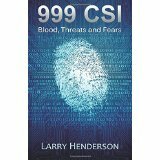 999 CSI provides an unforgettable insight into the highs and lows of a life dedicated to forensics, a journey that takes us into a world that we never get to see, a world filled with cruelty matched only by the courage of those who work tirelessly for justice. At turns breathtaking, fascinating, hilarious and tragic, Larry Henderson lifts the lid on a truly astonishing world. "Larry’s groundbreaking work features some of the UK’s most notorious crimes - a key piece of forensic evidence from one of Larry’s murder cases is displayed at Scotland Yard’s infamous Crime Museum. At turns breathtaking, fascinating, hilarious and tragic, 999 CSI opens up a truly astonishing world that most people never get to see, a world filled with cruelty, matched only by the courage of those who work tirelessly for justice. A truly great book." "I'd recommend this interesting memoir." "A fascinating insight into the world of forensics before the advent of DNA testing. I enjoyed this book immensely and would recommend it to those who have an interest in the subject." "A very well written account of the author's experiences as a Scenes of Crime officer in London. I would recommend this book. " "I found the book particularly interesting because here we have for a change the crime scene in London. The author's writing comes across as honest, his accounts are gripping and also at times entertaining." "An informative and well-written book, which gives an insight into the work of SOCO. Recommended. " "A page-turner from start to finish... Highly recommended."